This is a delicious recipe which I cooked last week for my friends wedding anniversary. As usual I rushing and didn’t have time to marinate the chicken over night but it still came out tasting really good. I used chicken quarters on the bone, I started them in the oven and then gave them some colour by finishing them off on the BBQ. The chicken was really moist and tender and I served it with an assortment of salads and cumin-crushed new potatoes. 1. In the small bowl of a food processor, blitz the ginger, garlic and vegetable oil until you have a smooth paste. Add the juice of 1/2 lemon, season and rub all over the chicken; leave to marinate in the fridge for at least an hour or overnight. 2. Next mix together the remaining ingredients except the coriander and lime. Toss with the chicken and marinate again in the fridge for at least an hour, or overnight. 3. When ready to cook, preheat the oven to 200°c, gas mark 6. Roast the chicken for 35 – 40 minutes until cooked through, the juices run clear and no pink meet remains. You can also roast for 30 minutes, then finish cooking on the BBQ. Scatter over the coriander and serve with the lime wedges. This recipe is from Master Chef winner Dhruv Baker. The burger gets a very bad name in this country and its probably a lot to do with some very dodgy ingredients that mass produced burgers contain. If I’m short of time I will sometimes buy fresh burgers from my local butcher but my preference is to make them myself. This is a recipe from one of Jamie Oliver’s first cookery books and they have been a winning burger in our family for some years. You can make then as big or as small as you like, I usually make 4oz burgers and for those with bigger appetites well they can have two in their bun! This recipe is so easy to do, I usually double the recipe and freeze them until needed. Get the children involved in the process and teach them that its fine to treat yourself to a burger now and then if you use good quality ingredients. Happy BBQ season! Mix all ingredients together, use bread crumbs as needed to bind and lighten the mixture. Divide into 4oz balls and shape with your hands to form your burger. 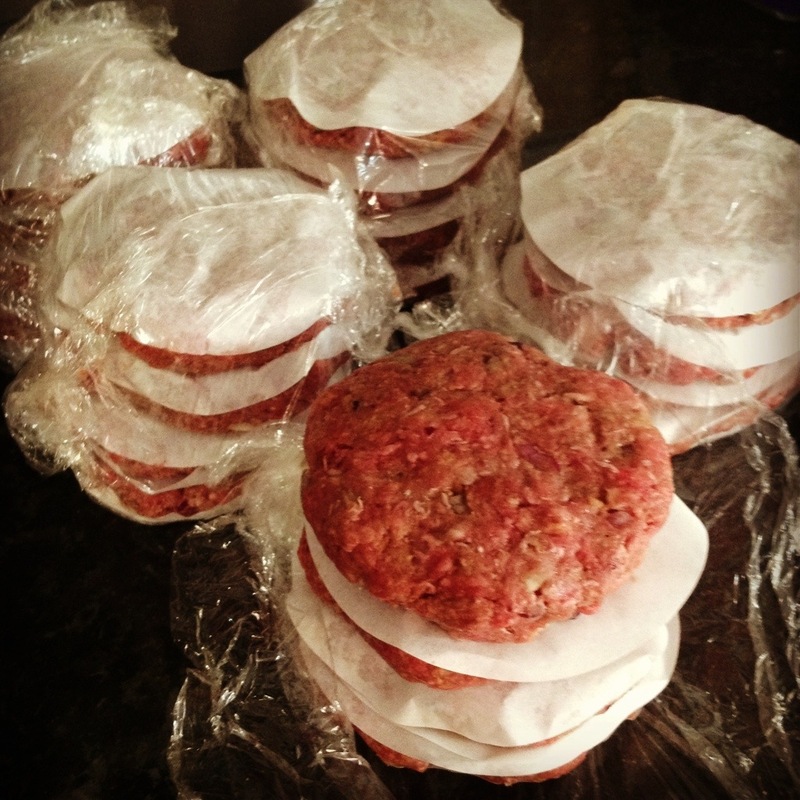 Use straight way or freeze using wax paper to separate the burgers. When you’ve got those coals nice and hot, slam those little beauties on the Barbie! Rhubarb season is here. I had in my mind this idea of turning a bundle of rhubarb that was sitting on my work top into a cake which included the addition of custard. I started to work on this, but didn’t get very far as I soon came across this recipe on ‘The Good Food’ website. 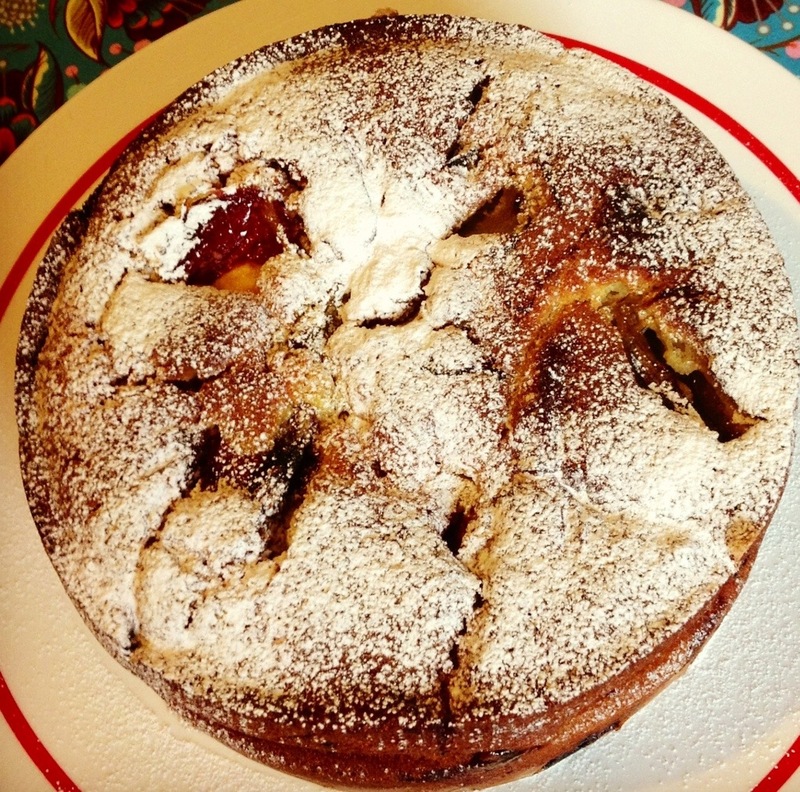 This is a delicious cake and can be served as an afternoon treat with a cup of tea or as a delicious pudding slightly warmed and topped with cream. 1. Make the roasted rhubarb first, carefully draining off the juices before you let it cool. Butter and line a 23cm loose-bottomed or springform cake tin. Heat oven to 180C/fan 160C/gas 4. 2. Reserve 3 tbsp of the custard in a bowl. Beat the rest of the custard together with the butter, flour, baking powder, eggs, vanilla and sugar until creamy and smooth. 3. Spoon one-third of the mix into the tin, add some of the rhubarb, then dot with one-third more cake mix and spread it out as well as you can. Top with some more rhubarb, then spoon over the remaining cake mix, leaving it in rough mounds and dips rather than being too neat about it. Scatter the rest of the rhubarb over the batter, then dot the remaining custard over. 4. Bake for 40 mins until risen and golden, then cover with foil and bake for 15-20 mins more. It’s ready when a skewer inserted into the middle comes out clean. Cool in the tin, then dredge with icing sugar when cool. Tuesday night 6pm, staring into the fridge, no dinner prepared. In fridge, a ball of mozzarella just about to go over its use by date, half a length of Chorizo and a small bowl of leftover cold new potatoes. In the other room one hungry teenage daughter, who loves pizza and has just completed the choosing of her GCSE language…Spanish! Oh yes and one very tired Mama needing to soak her very cold bones in a hot bath and who has also forgotten to buy bread for breakfast. 1. Make up a batch of strong white bread dough. I did use my kenwood mixer bread hook as time was tight. Leave the dough to rise in a warm place. 3. Very gently fry so that the chorizo oils start to release and coat the potatoes and onion, tip into a bowl and leave to cool. 5. Simmer this mixture over a medium hit until it starts to reduce and get nice and thick. Take off heat and leave to cool. 6. Take a good long bath and if you have a little shelf beside the bath, light candles and just to finish off, place a large glass of wine there too. 7. When your spirits have risen, go and see if the same has happened to the bread. It should have doubled in size. 8. On a floured work top knead the dough for a few minutes and then roll out a piece to fit both your stomach and your pizza tin. I like my pizza dough on the thin side, don’t forget this will rise again and probably double it’s thickness. 9. With the left over extra dough, place in a small bread tin, cover and leave to rise till it doubles it size. That’s breakfast bread sorted. 12. Leave in a warm place to allow the dough to double it’s size. 13. When ready cook in a hot oven 230c, gas 8 for around 20 mins. Keep an eye on it, lower its position in the oven if the top is browning too quickly. 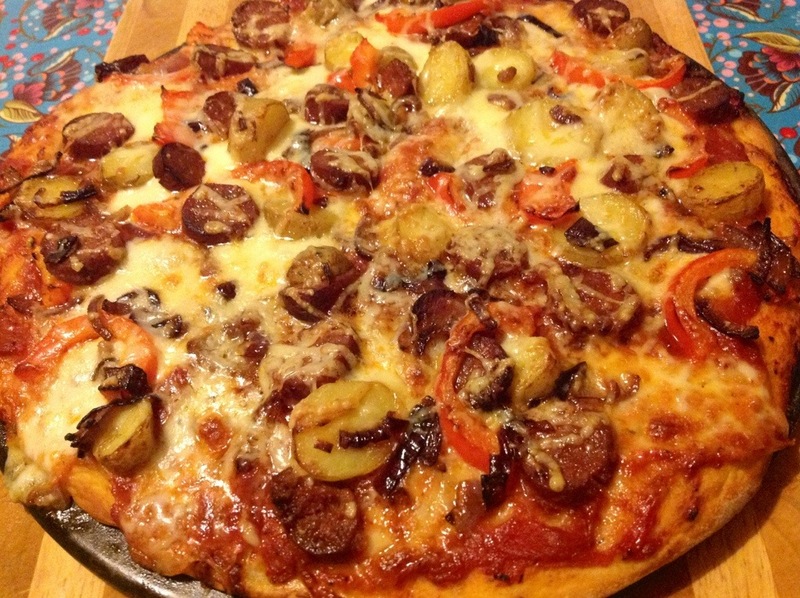 Make sure the underneath of the pizza is cooked and not soggy. Metal tins are usually the best for this. 14. Sit and enjoy while you bread goes into the oven (35mins approx). 15. Fall into bed with a full stomach and the smell of freshly baked bread wafting around the house. Feel as smug as you like. It’s Saturday morning and I have a block of good quality puff pastry needing to be used up in the fridge. It’s a big day for the Rugby and my Dad will be sitting glued to the screen this afternoon. I know exactly how to turn this pastry into a mouthwatering treat that could put a smile on my Dads face no matter the score. Please do not compare these with any shop bought versions, they simple don’t compare. You will be amazed how easy they are to make… Come on ENGLAND! 500g (18oz) packet of quality puff pastry. 1. Preheat oven to 220 C / Gas mark 7. Sprinkle a baking tray with water. 2. In a small saucepan over medium heat, melt butter. Stir in currants, mixed peel, demerara sugar, mixed spice and orange zest. Stir until sugar is dissolved and fruit is well coated. Remove from heat. 3. On a lightly floured surface, roll out pastry to a 5mm thickness. Cut out eight 13cm circles, using a saucer as a guide. Divide the fruit mixture evenly between the circles. 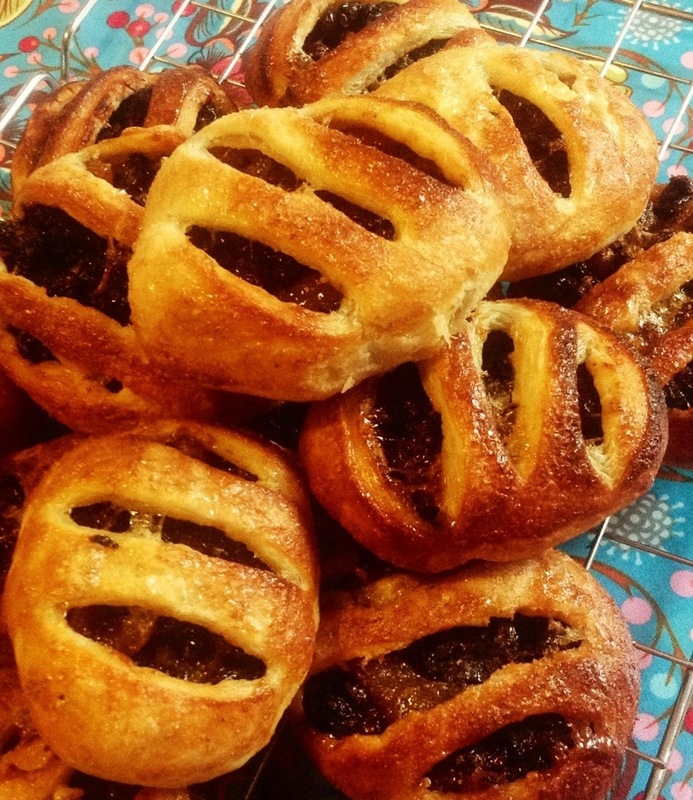 Moisten the edges of the pastry, pull the edges to the centre and pinch to seal. Invert filled cakes on the floured surface and roll out gently to make a wider, flatter circle, but do not break the pastry. 4. Brush each cake with egg white and sprinkle generously with caster sugar. Make three parallel cuts across the top of each cake, then place them on the prepared baking tray. 5. Bake in preheated oven 15 minutes, until golden. 6. Best eaten while still warm. Freeze the rest and thaw and warm in the oven when needed. 1.Preheat your oven to 180°C/350°F/gas 4. 2. Put the rhubarb and half the sugar into a pan. Add the orange juice and zest, put a lid on top, bring to the boil and simmer for a few minutes. Remove the lid and simmer for around 5 more minutes, until the rhubarb has softened slightly. Spoon into an ovenproof baking dish or individual dishes and spread out evenly across the bottom. 3. To make your crumble topping, use your fingers to lightly rub together the flour and butter until the mixture resembles fine breadcrumbs. Stir in the oats, the rest of the sugar and the stem ginger. (If you like, you can make the crumble topping in a food processor. Just whack in the flour, butter, sugar and stem ginger and whiz up. Add the oats for the last 10 seconds.) Sprinkle the crumbs over the rhubarb and bake in the preheated oven for 40 to 45 minutes, or until the rhubarb is bubbling up and the crumble is golden. Another one of Jamie Oliver’s little gems! I’m pretty sure most households at times end up with a few bananas sitting in the fruit bowl that nobody will touch as they have gone pass the point of ripe! Well, this very simple recipe can turn those bananas into something pretty special. The aroma that fills the house while its cooking is just amazing. 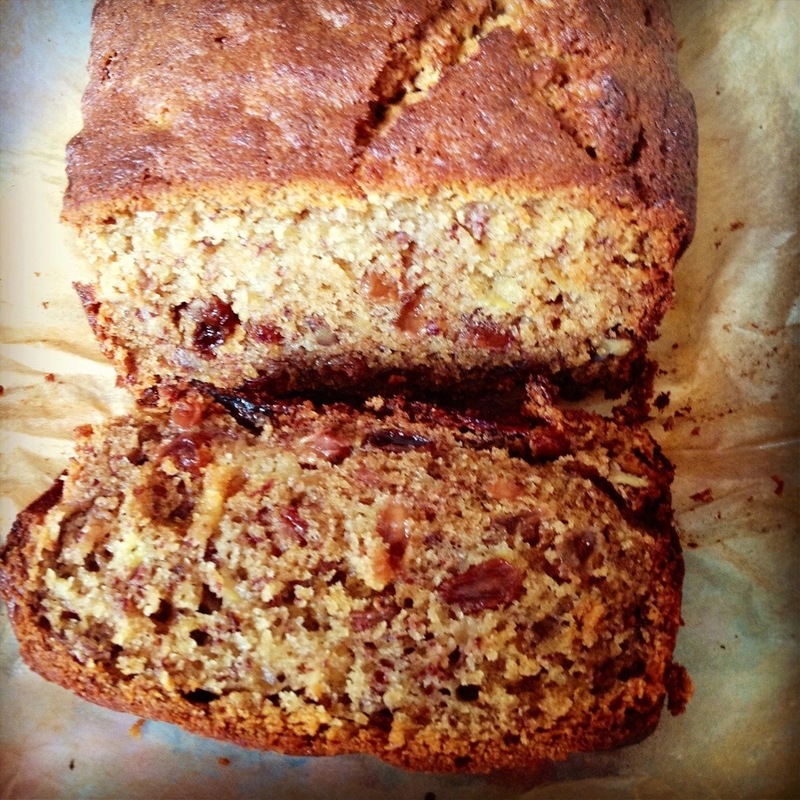 The rum soaked sultanas add a wonderful little extra flavour to this delicious loaf. 1. Put the sultanas and rum or Bourbon in a smallish saucepan and bring to boil. Remove from the heat, cover and leave for an hour if you can, or until the sultanas have absorbed most of the liquid, then drain. 2. Preheat the oven to 170°C/gas mark 3 and get started on the rest. 3. Put the flour, baking powder, bicarb and salt in a medium sized bowl and, using your hands or a wooden spoon, combine well. 4. In a large bowl, mix the melted butter and sugar and beat until blended. Beat in the eggs one at a time, then the mashed bananas. Then, with a wooden spoon stir in the pecans, drained sultanas and vanilla extract. 5. Add the flour mixture, a third at a time, stirring well after each bit. 6. Scrape into it the loaf tin and bake in the middle of the oven for 1 to 1 1/4 hours. When it’s ready, an inserted toothpick all fine skewer should come out cleanish. Leave in the tin on a rack to cool, and eat thickly or thinly sliced, as you prefer. 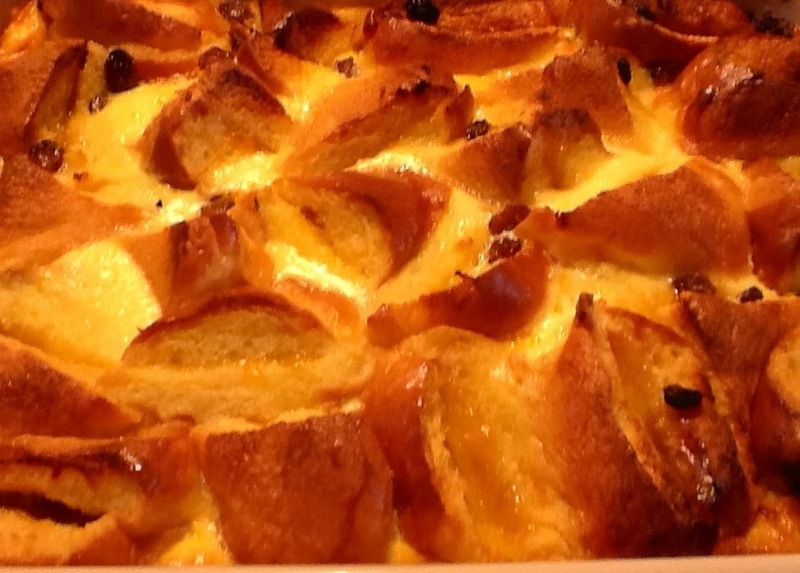 I love bread and butter pudding and it’s a pudding we often had when I was growing up. This one is more extravagant, but it’s worth the extra cost as you end up with a truly stunning dessert. I made this with my ‘Two Creative Cooks’ hat on for a function this weekend and it went down a storm. I had a loose recipe to follow, but then changed it to suit my very naughty taste buds and then served it with thick Cointreau cream. I know I will never be thin, but quite honestly I don’t care, I know which side my bread is buttered!! 6 tbsp Cointreau or Grand Marnier if you prefer. 1. Preheat the oven to gas 179c /325f/ gas 3. 2. Butter a 2 litre (4 pint) shallow pudding dish. 3. Put the Cointreau and sultanas in a small pan, bring to the boil and simmer for one minute, turn off the heat and leave the fruit to plump up in the liquor. 4. Slice the rolls in half length ways and spread one half with apricot jam and the other with a little butter ( you only need a very light spread of butter, as the brioche is already very buttery) sandwich back together and cut the brioche rolls into three thick triangles. 5. Stand these with the points to the sky in the dish, sprinkle with the sultanas and remaining liquor. Grate the zest of an orange over the brioche. 6. In a bowl whisk the sugar, whole eggs, egg yolks, cream and milk together. Pour over the brioche and leave to stand for 15minutes. 7. Sprinkle over the Demerara sugar and bake for 45 mins, the rich custard should just be setting. 8. Serve warm with ice cream or cream flavoured with some of your chosen liquor. 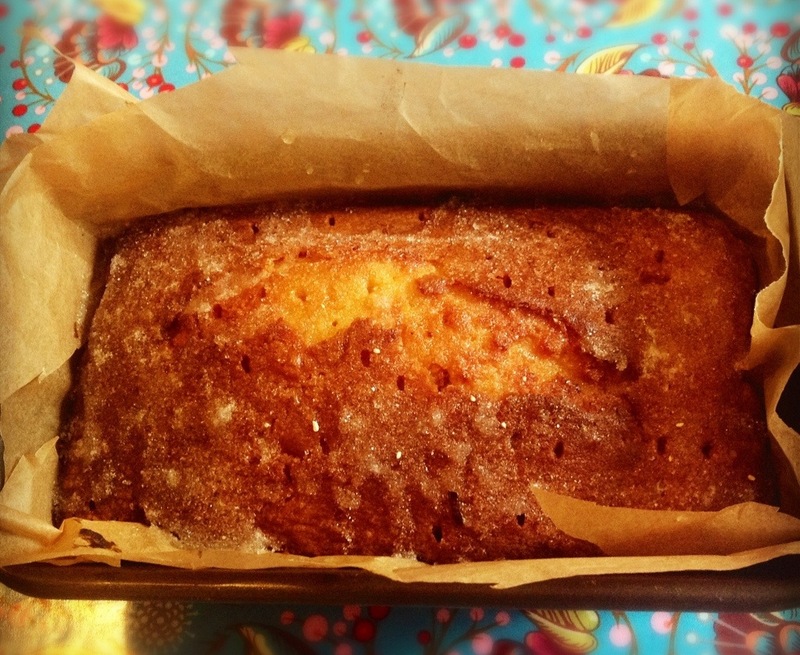 Lemcake…a perfect antidote for cold and flu misery. This a lemon drizzle cake with a twist. I have added chopped Chinese stem ginger to give an extra zing to this cake, along with the zest and juice of two whole lemons. The smell of this cake cooking is almost tonic enough. Lemon and ginger, are rich in antioxidant, antiseptic and antiviral properties, so let the ‘Lemcake’ take you into a little bit of healing heaven, enjoy! 2 tbsp stem ginger syrup ( the syrup, that the ginger is preserved in) you could use some honey instead. 1. Preheat the oven to 180ºC/ fan 160/ 325f /gas mark 4. 2. Beat together the eggs, flour, caster sugar, butter, baking powder, lemon zest and chopped stem ginger until smooth in a large mixing bowl and turn into the prepared tin. 3. Bake in the preheated oven for about 35-45mins, or until golden brown, shrinking away from the sides of the tin and springy to the touch. 4.While the cake is still warm,prick all over with a skewer or cocktail stick. Mix together the sugar, syrup and lemon juice, and pour over the warm cake. Allow to cool. You can slice this up when cool and cling wrap individual pieces. Place in a sealed plastic bag and freeze. Perfect for days when only Lemcake will do. 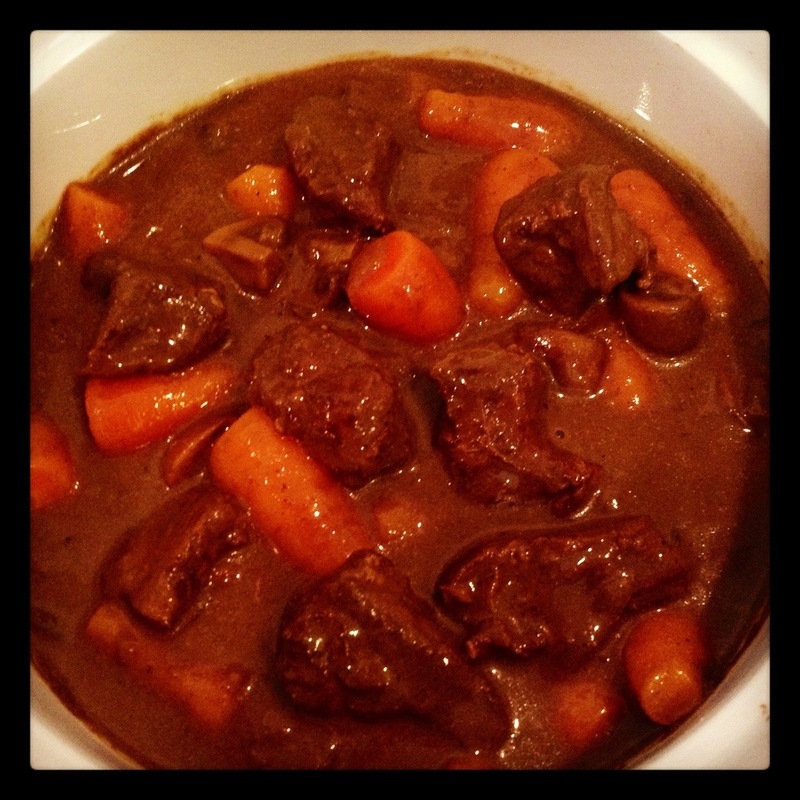 A delicious spicy beef casserole, perfect to warm you up in the winter months. Serve with cheese topped dauphinois potatoes and peas. 1. Preheat the oven 160°c/ 140°C fan/325°F/gas 3. Meanwhile, heat the oil in a large nonstick frying pan or casserole, at the cubes of meat, and fry quickly until golden brown all over. Remove with a slotted spoon and drain on kitchen paper. You may need to do this in batches. 2. At the onions and mushrooms to the pan and fry over a high heat, staring occasionally for 3 minutes or until starting to soften. (2 1/2 fl oz) of the stock. Whisk by hand until smooth. 4. Add the remaining stock to the pan and bring to the boil. Spoon about half the hot stock into the mustard mixture and whisk by hand to give a smooth paste. Pour the mixture back into the pan, whisking over a high heat until thickened. 5. Season with salt and freshly ground black pepper, then return the meat to the pan. Bring to the boil, cover with a lid, and transfer to the oven for 2-2 1/2hrs Or until the meat is tender. 6. While the meat is cooking, cook the carrots in boiling salted water for a few minutes or until just tender. Drain and refresh in cold water. 7. To serve, bring the casserole to the boil on hob. Add the carrots, check the seasoning, and boil for a few minutes or until the carrots are hot. Sprinkle with parsley, is using, and serve. The dish can be made up to the end of step 5 up to 2 days ahead. Freeze without the carrots for up to 2 months. lorna charnock on The Best Nut Roast.